World Art Day is an international celebration of the fine arts, that annually takes place on April 15. The holiday is observed since 2012. World Art Day was created by the International Association of Art. The idea was proposed at the 17th General Assembly in Guadalajara and the committee unanimously approved it. The date of the holiday became the birthday of the great Italian painter, sculptor, writer, thinker, philosopher, mathematician and scientific innovator Leonardo da Vinci. World Art Day aims to promote the values, that art has brought to the world since the beginning of time. It raises public awareness about the importance of creative activity worldwide. 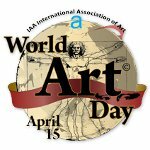 The first World Art Day was observed on April 15, 2012. Celebration was supported by national committees of the International Association of Art. National committees of Sweden, France, South Africa, Slovakia and Venezuela organized outdoor exhibitions with sculpture, paintings, prints and cooking demonstration in honor of Leonardo da Vinci.